The cooling property markets in China and Singapore should help attract foreign buyers to Malaysia, say industry players. China has tightened loans,restricted purchases of multiple properties and imposed higher down payments while Singapore has introduced tougher measures aimed at foreign buyers, who have become increasingly visible in the residential sector. “This is a good time for Malaysia to attract foreign buyers. But there are three key areas that we have to improve on, which are security, education and healthcare,” said Bandar Utama Development Sdn Bhd managing director, Datuk Teo Chian Kok. 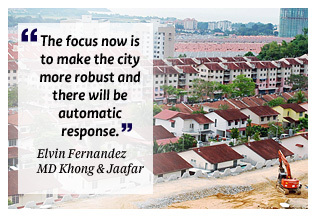 Khong & Jaafar managing director Elvin Fernandez said there was a future for properties in Malaysia as more foreigners were expected to invest here. He said once projects under the Economic Transformation Programme kicked in, there would be more demand for residential properties. “The focus now is to make the city more robust and there will be automatic response,” he said at a media roundtable at Balai Berita, here, yesterday. national-level Malaysian Property Exposition (Mapex) for 2012 would be a good platform to introduce Malaysian properties to overseas buyers. than 300 housing developments across Malaysia. The exposition, themed “Home and Abroad”, will also have foreign developers showcasing their projects here for the first time. They include Century Properties Inc from the Philippines and Knight Knox International from Britain. Ng said Mapex 2012 was expected to generate property sales of up to RM100 million.